Harry K. asks: Who invented the Oreo cookie? In 1890, a group of eight large New York City bakeries combined to form the New York Biscuit Company and built a giant six-story factory in West Chelsea. Eight years later, they merged with their competitor, Chicago’s American Biscuit and Manufacturing to form an even larger conglomerate – the National Biscuit Company, but the factory and headquarters remained in Chelsea. In 1901, the National Biscuit Company put their abbreviated company name on a box of wafers for the first time – Nabisco. Soon, Nabisco became the company’s official name. On April 2, 1912, the National Biscuit Company announced to their sales team that they were introducing three “highest class biscuits,” in a grouping they called the “Trio.” Two of the cookies, the Mother Goose Biscuit and Veronese Biscuit, didn’t sell particularly well and quickly disappeared from the shelves. The third, the Oreo Biscuit, did. “Two beautifully embossed chocolate-flavored wafers with a rich cream filling,” the Oreo Biscuit was sold in a yellow tin with a glass cover for approximately 30 cents a pound (about $7.13 today). While it went national in April, it was just a month before that the National Biscuit Company first registered the product with the US Patent and Trademark Office (registration number 0093009). It is commonly stated the given date of registration was March 6th, which is why that is National Oreo Day. However, a simple patent and trademark search reveals that oft-repeated date is incorrect. In fact, it was actually filed on March 14, 1912 and registered on August 12, 1913. So how did they come up with the idea of the Oreo? By using the time-honored business practice of stealing the idea from a competitor and then marketing it better than the original. You see, there was another popular creme-filled sandwich cookie that came before the Oreo, made by Sunshine Biscuits. Sunshine Biscuits was a company run by Joseph and Jacob Loose and John H. Wiles, the former of which were originally part of the great bakery conglomeration of 1898 (the one that formed into the National Biscuit Company). 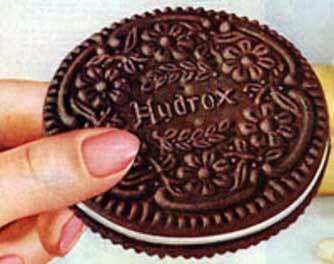 In any event, in 1908, four years before the Oreo, Sunshine debuted the upscale, and soon to be very popular, Hydrox biscuit, which the Oreo was a pretty blatant rip-off of, cream filling, embossing and all. Of course, Nabisco denies this is where the idea for the Oreo came from, but the evidence at hand strongly indicates otherwise. As for the name, there has never been a firm answer for why the National Biscuit Company chose “Oreo,” though there are several theories. There is speculation that “Oreo” is derived from the French word for gold – “or,” since the original packing was gold and the item was meant to be a “high-class” confectionery. 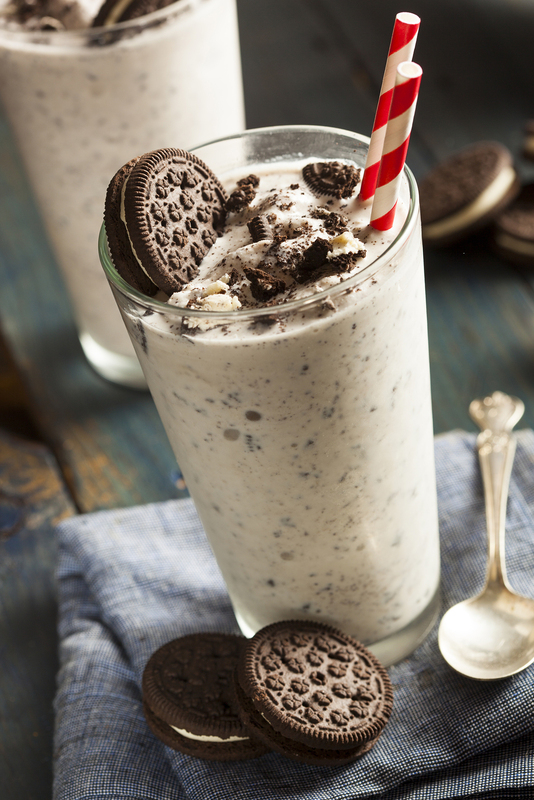 It could also come from the Greek word for mountain or mound – “oros,” since an Oreo is a “mountain” of a cookie. It has also been speculated that maybe it was named for the cookie itself, two “O” shape cookies sandwiching the cream, O-cream-O. The identity of the designer behind the distinctive emboss on top of each cookie – or what the emboss signifies – has also become part of the Oreo mystery. The first design was simple enough – with the name “Oreo” and a wreath at the edge. In 1924, the company augmented the original design to go with a 1921 name tweak – from “Oreo Biscuit” to “Oreo Sandwich.” The 1924 design added a ring of laurels and two turtledoves. Twenty years later, in 1952, is when today’s elaborate, beautiful, design first appeared. But what does the design signify, if anything? Historians believe the circle that encases the word “oreo” with antenna-type symbol on top was an early European symbol for quality. Cookie conspiracists believe that the antenna symbol is actually a Cross of Lorraine, a symbol identified with the famed Knights Templar. The “four-leaf clovers” that surround the name could be just that or it could be the cross pattee – a geometric pattern of four triangles radiating outwards that is also associated with the Knights Templar and the Freemasons. It’s up to the individual what they want to believe, but this author thinks the Oreo cookie is a delicious Da Vinci Code style map leading to a treasure buried a thousand years ago… Or as I like to call it, the probable plot to National Treasure 3. Now, who designed the emboss? Evidence points to William Turnier. However, while Nabisco admits that a man by the name of William Turnier worked for them for fifty years, they deny that he developed the 1954 design. That said, his son and drawn proof indicate otherwise. Turnier joined the company in 1923, working in the mail room. He eventually worked his way up to the engineering department, helping make the dies that made the cookies, the industrial-sized cookie cutters as it were. So where’s the evidence? In the home of Bill Turnier, William’s son, perched on a wall is a framed 1952, line drawn blueprint of the modern Oreo design. (If you’re curious, Why Blueprints are Blue) Underneath the blueprint, it is written “Drawn by W.A.Turnier 7-17-52,” two years before the design would find itself on the Oreos sold in stores. Despite this evidence, the Kraft (who now owns Nabisco) Corporate Archives only says that Turnier was a “design engineer” and he received a Suggestion Award in 1972 for an idea “that increased the production of Nilla Wafers on company machinery by 13 percent.” So can Bill shed any light on what his father was thinking when he seems to have drawn the design? Not really, though he did admit that the design, while beautiful and resembling more mysterious symbols, probably had nothing to do with the Knights Templar. His father wasn’t a Mason either. As for the stuff between the intricately-designed cookies, the filling- it was made partially of lard – pig fat – until 1997. In 1994, Nabisco embarked on a nearly three year revamping process of the filling to take the lard out. In charge of this was Nabisco’s principal scientist Sam Porcello, otherwise known as “Mr. Oreo.” By that point, Porcello was already a cookie legend, holding five Oreo related patents, including Oreos encased in white and dark chocolate. By December 1997, the Oreo cookie was lard-free, but there was another problem – the lard had been replaced by partially hydrogenated vegetable oil; yes, the very much not good for you trans fats. As the Chicago Tribune put it, “Later, research showed that trans fat was even worse for the heart than lard.” Finally, in January 2006, healthier (and more expensive) non-hydrogenated vegetable oil was put into Oreos instead. Today’s filing is additionally made with loads of sugar and vanilla extract creating a cookie that still is delicious, but slightly better for you. Or, perhaps more aptly, less bad for you. Bill also says that his father created or tweaked other well-know Nabisco designs in his half century with the company, including tweaks on the Nutter-Butter, the Ritz Cracker, and a dog’s favorite treat, the Milkbone. The basic Oreo cookie is 71 percent cookie, 29 percent cream filling. I also believe the first Oreo was sold in Hoboken, NJ… The Nabisco factory is now the Chelesa Market in NYC. Actually there is the word oreo in greek, and means nice, beautiful, tasteful. the only difference is that the intonation is in the ‘e’ and not the first ‘o’ as in the biscuit name. i think this is the actual greek name theory.. good job by the way!! I agree 100% with Kat. In Greek the word for “nice” is oreo with the accent/inflection on the ‘e’. Letter for letter conversion for Oreo is ¨ορεο¨…. Not being able to find a web site to answer my questions I am posting here. I have been told that the production of the Oreo Cookie has been moved to other countries, mainly Mexico. Is this the truth and should not the point of manufacture be stamped in Large Print on the front of all food products? We as consumers need this information so we can make the right choice for our kids! The manufacturing standards and inspections process in other countries are not the same as they are in this country! I understand that sugar is cheaper in other countries and the bottom line is most important to companies. However, our kids health and safety are #1 to us as parents! I have heard that the cream was made from oily fats or “Oleo'” which includes tallow, lard, and margarine.